I was thinking about it, and really, it's pretty silly for me to maintain a separate project log for every one of my projects. I like to have several things going at once to keep me sane-- it makes it possible to assemble huge armies if you never really get burned out painting one of them. I can also show off my Black Legion refurbishment project-- it's not anything I really felt like posting in a project log before, but I figure I can show the squads as they get cleaned up. I basically didn't play with my Chaos Space Marines for the duration of 5th Edition because I hated that stupid Codex, and my painting skills have improved drastically since I shelved the army. Not that they were ever bad-- they won best painted pretty regularly at events-- I just can do better now. The final reason I figured I could just start a thread of collected works is that I can also just show random models I've painted in the meantime in here, keep a link to my hobby projects in my signature for easy access, and when the fancy strikes me to start a new project, I don't need to add more clutter making a new thread. 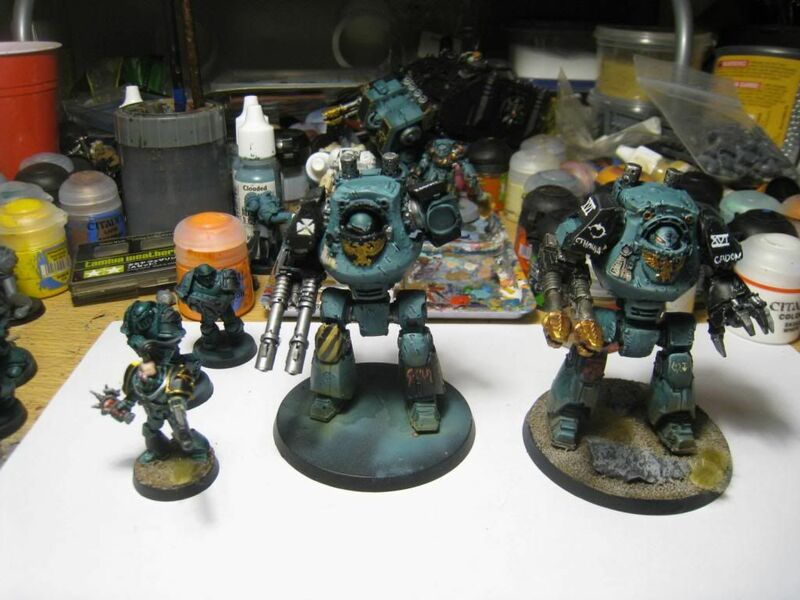 From The Sons of Horus project, my first Contemptor and Praetor. A special thanks to ResinForge for a great deal on the torso and legs that went into the Praetor-- there aren't a lot of bits services out there that offer a good deal on Forge World bits, but he did, and gets my recommendation if you're after individual components. This is sort of a quick look at my desktop at the moment-- the second contemptor is well on its way, and I have a bunch of Tactical Marines I'm working on. I figure I'll probably run squads of either 10, 12, or 15... I haven't decided yet...so I'm just sort of painting guys with bolters and I'll figure out where they go once I settle on how I want the squads arranged. This is the last squad I finished for The Pyre-- a Legion Tactical Support Squad for Apocalypse games. I figure nine flamers and a sergeant with a combi-flamer and power sword is very thematic for the army. 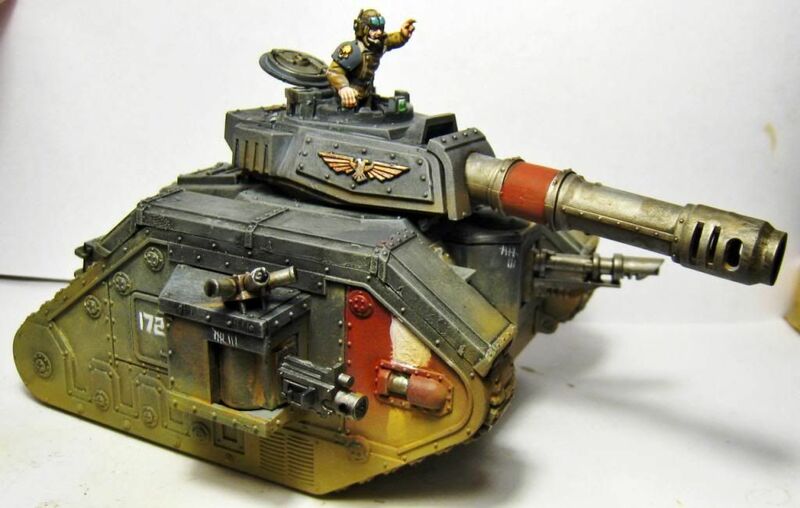 I also got a Redeemer to a point where I'd play with it, although I'm scrounging up some assorted Chaos vehicle plates to cover the Imperial iconography up. I'm also planning on going back and cleaning up the highlights. It's another one of the things I've added to the army for Apocalypse games, which I don't play nearly as often as I'd like to. 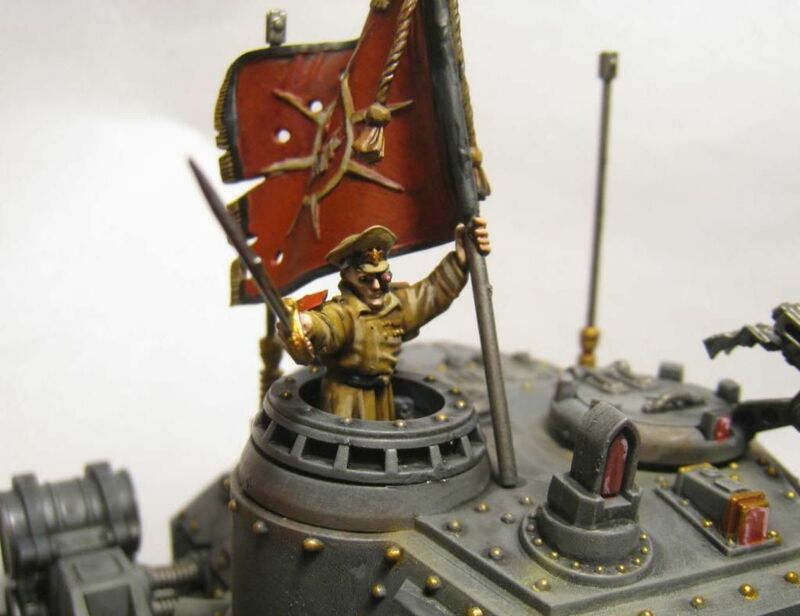 On a totally unrelated note, I've had the odd urge to paint some Imperial Guard stuff. I've always had a small Guard army... I just never really got it off the ground and onto the tabletop. 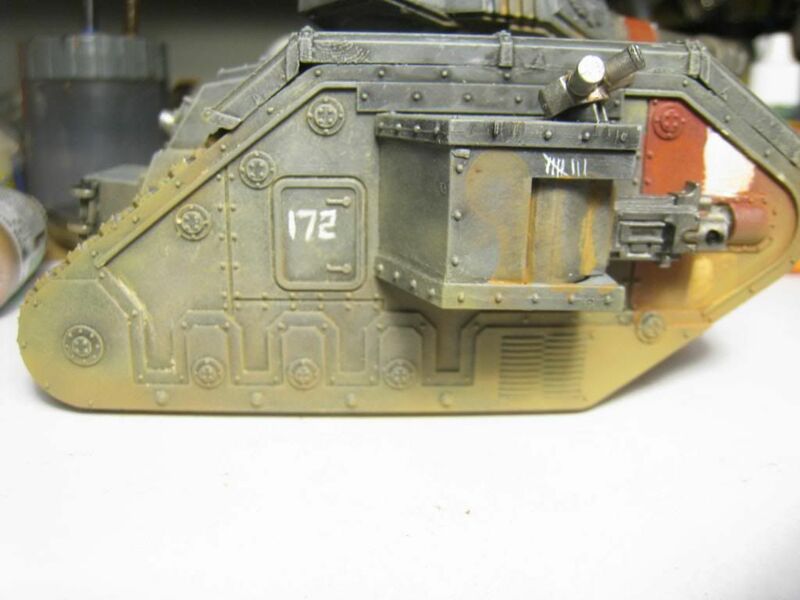 I don't know why I never showed this vehicle off-- this was sort of my "learn to use an airbrush to do weathering" project. I'm pretty happy with how it came out, considering all the weathering was done with an airbrush and I had no clue what i was doing with it. So yeah, stay tuned for pretty regular updates from here on out-- I'll probably just post whatever I've been up to in this thread from now on. Sweet, looking forward to future posts. Got a few more Tactical Marines done for the Sons of Horus, along with a sergeant I intend to lead a Tactical Support Squad. 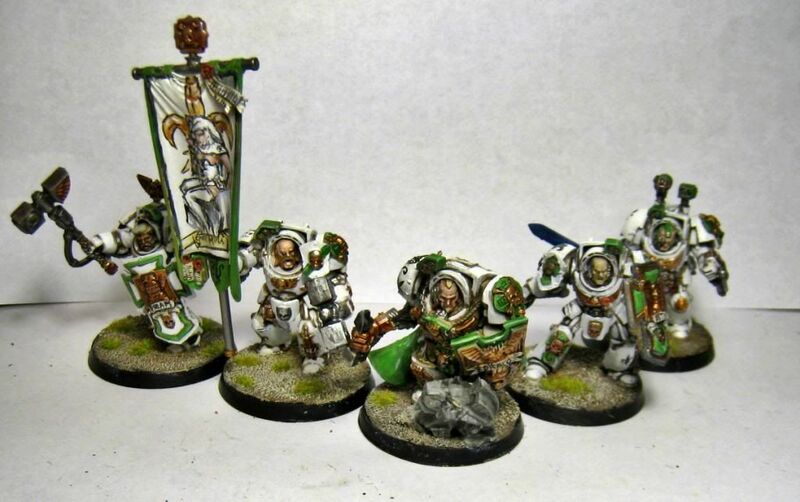 I also finished up my Lions Rampant 1st Company command squad, most of which involved touching up a couple models and finishing the apothecary. Lately, I've also been cleaning up my old Black Legion army, like I said. I haven't bothered repainting anything, even though the models really need to be touched up a bit-- there are just too many of them for that. I have been rebasing them, though, and I have painted up the Dark Vengeance contents to go with the old army-- just with much cleaner highlights and sharper detail. 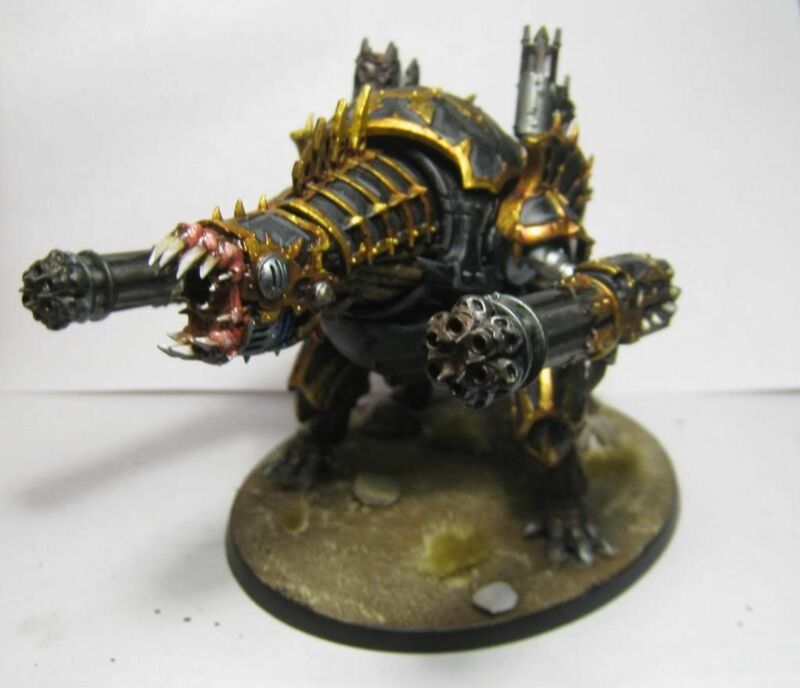 And a forgefiend. I have another on my desk waiting to be painted. It's hard to say which my favorite item out of the recent Chaos release was-- it's a toss-up between the Forgefiend and the Warp Talons, since both are awesome models that are also great in-game. Lots of pretty shinies there, Horus! Usually the lack of updates from me where hobby things are concerned means I've been up to something big. And, I certainly have been. As a bribe to work on the store's terrain and paint up some new stuff (namely, two skyshield landing pads, a fortress of redemption) for in-store use, I was given a healthy chunk of store credit, which ended up going to this. 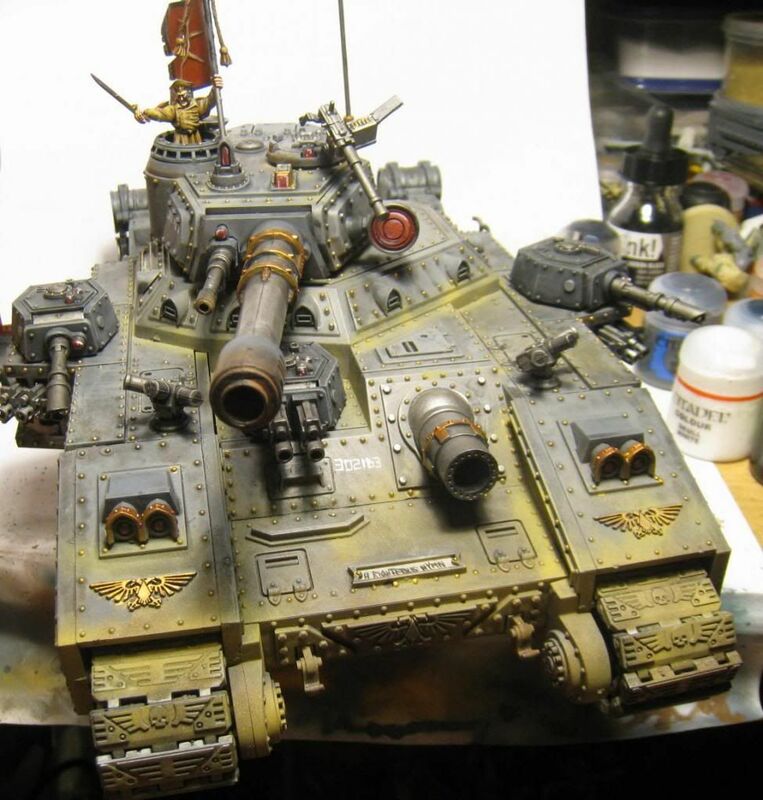 This is the second Baneblade I own, and I painted this one mostly with an airbrush. It's something I'm still learning to use, and I have to say, owning an airbrush now has given me a new appreciation for painting large models. I used to hate painting vehicles, but with the airbrush, they've become a much more interesting project for me. The obligatory "Drive me closer so I can hit them with my sword!" 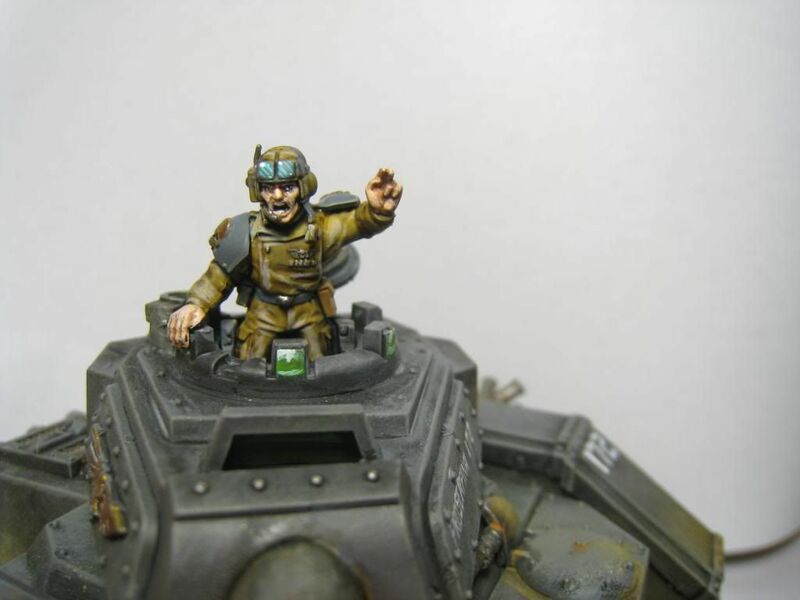 tank commander. "A Righteous Hymn" and "Our Lady, Deliverance", Hestia XXVI Armoured. 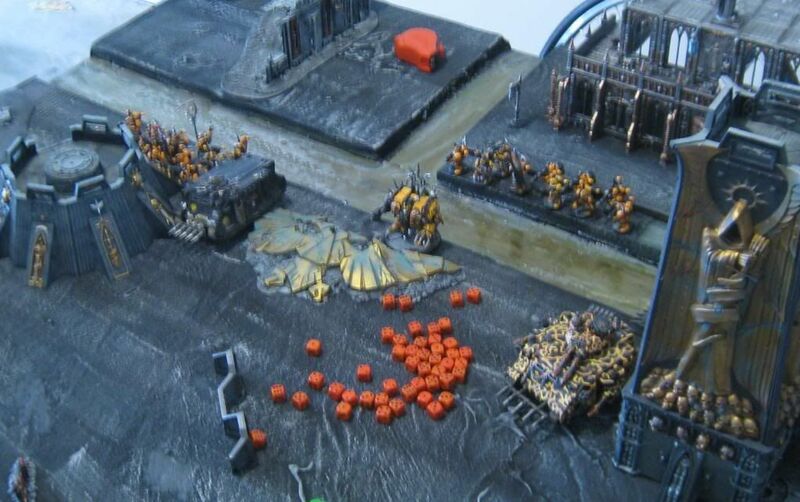 And, in case anyone was interested, there are some chunks of the Fortress of Redemption on my table, with my Pyre Chaos Space Marines deployed for a game. When this was taken I hadn't finished the Fortress and taken it back to the store yet-- but I figured if I had parts of it done, I might as well play with them while I had them handy, right? 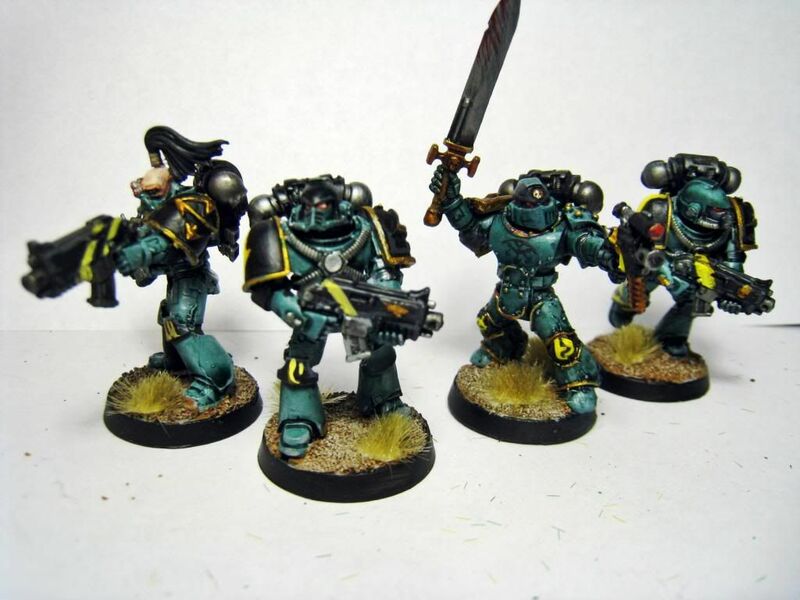 Sons of Horus looking awesome! 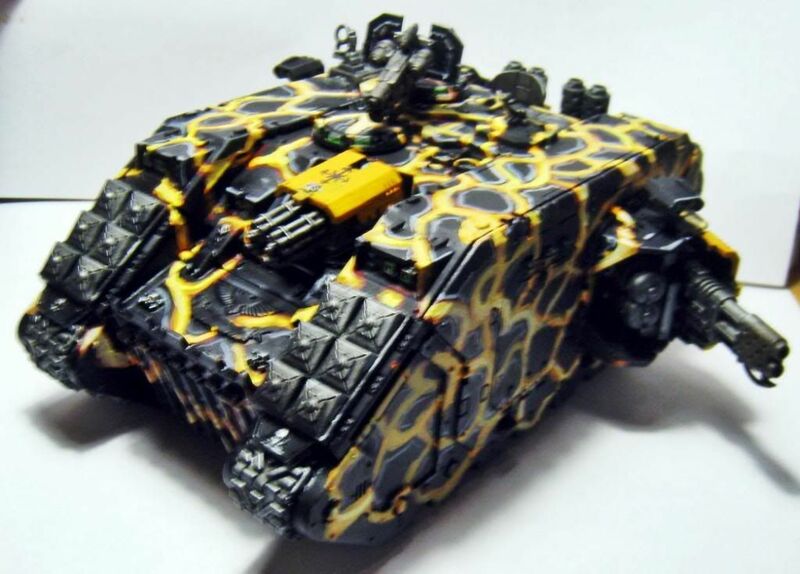 I like the Pyre too, not sure if I could pull off the paint job. Tanks are looking good, mate. Did you decide to convert one of them so you can make it a fellblade as well or say screw it? I thought about it. I even went so far as making the main gun modular to switch between the baneblade and the hellhammer. 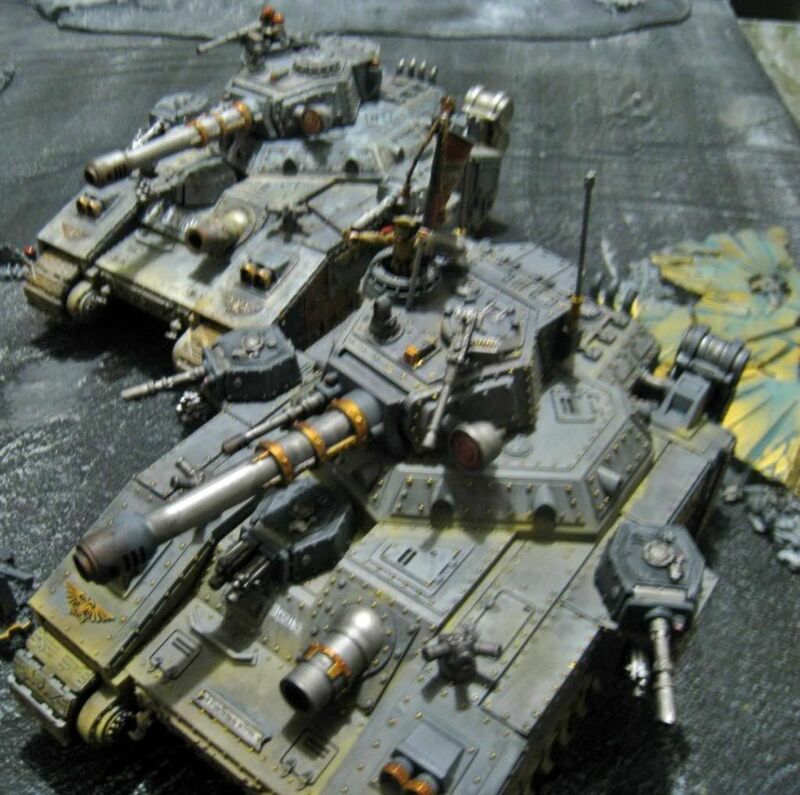 And then I sat and thought about it, and realized that even in dense terrain, I think I'd still prefer the complete flexibility of the baneblade to the hellhammer. So I went ahead and just glued the main gun on for stability. 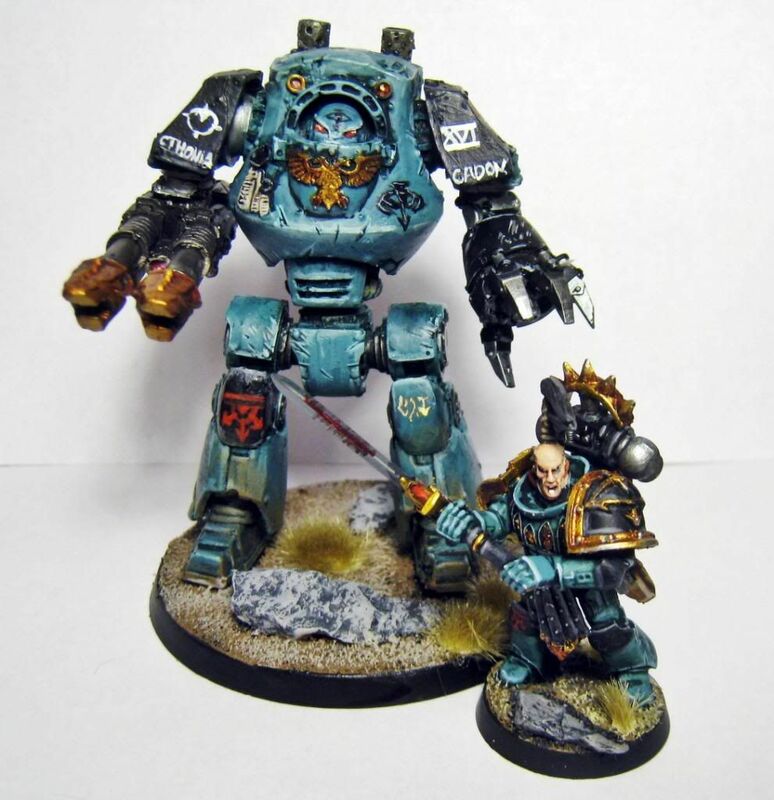 I ended up deciding that if I do get a Fellblade, I want it to match my Sons of Horus, and not just be a weapons swap for something that's not part of the Legion, as far as how it's painted. It's something that may happen down the road...we'll see.